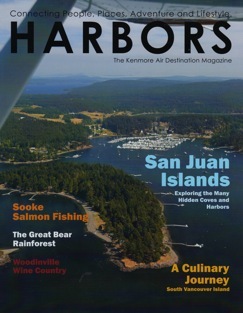 As you drive north on State Route 20 from Oak Harbor on Whidbey Island, you soon enter a stretch of scenic road that winds through typical Northwest forest. It’s pretty scenery, but nothing out of the ordinary for the Pacific Northwest. Then suddenly, you’re driving across Deception Pass Bridge and a stunning panoramic view hits you, literally taking your breath away. Nothing can prepare you for this magnificent scene—thick clumps of green cedars and tall bristly firs atop steep rocky fingers of land, that claw at the deep turbulent waters of the swirling waterway 182 feet below. From high up on the bridge, the dark green water below stretches away to merge with the horizon on both sides. Tiny islands in the near distance resemble tall ships, fighting the strong churning current. Gazing out to your left, beyond the mouth of the pass and Deception Island, the vast Straight of Juan de Fuca gives way to mysterious headlands, just smudges of gray and blue in the far distance. To your right, Hoypus Point and its opposing headland almost meet, then open out to a wider channel, with Skagit Island in the distance. If the weather is clear you’ll even see the mainland with its snow capped peaks further on. Deception Pass shows a bit of everything that Washington State tourism leaders boast about—an iconic scene of trees, water and mountains that decorates every Washington State tourist calendar and guide book worth its salt. Driving across the bridge without stopping to admire the view is a crime that tourist police should book you for—you need more than a few seconds to appreciate this scene. A few meters before the south end of the Bridge, you can pull into a parking lot and then walk across the bridge to fully appreciate the glorious vista. The parking lot also marks one of the entrances to some of the Deception Pass State Park hiking trails that lead to 4,134 acres of old growth forest, packed with camp grounds, fresh water lakes, bird watching, clamming, crabbing, fishing, swimming, and stunning views. The Park’s fourteen miles of shoreline, is perfect for experienced kayakers (intense tides make it too difficult for beginners), and it’s acknowledged as one of the most beautiful cold water diving spots in the world. It’s no wonder this is the most visited and photographed State Park in Washington, with over two million people exploring its trails each year. The long green bridge, completed in 1935 does not detract in the least from the gorgeous setting. With graceful curved arches supported by a lattice of massive studded steel girders resembling a sideways Eiffel Tower, the graceful bridge adds to the majestic scene, blending in with the Pass. The bridge, the pass, and the inhabitants of the Island, are historically intertwined. People have lived in the area around Deception Pass for thousands of years, with the Lower Skagit, Swinomish, and Samish being the most predominant Indian tribes. They hunted, fished and harvested plants in the area, and some of their shellfish middens are still being found. In 1791, Spanish explorers originally charted the waters dividing Whidbey and Fidalgo Islands. Then, on June 10, 1792, Captain George Vancouver aboard the HMS Discovery, sailed around what he thought was a peninsula. His capable Ship’s Master and chief navigator, Joseph Whidbey, exploring the shoreline in a smaller boat, circumnavigated what would become Whidbey Island, confirming that the rocky channel separating Whidbey Island and Fidalgo Island was not a river. After receiving Whidbey’s report, Vancouver promptly titled the channel Deception Passage, because he had been deceived into thinking the Island was part of the mainland. Vancouver then named Whidbey Island in honor of its discoverer. As the years passed, by the mid-19th century, hardy European and U.S. settlers moved to Whidbey Island. Indeed, with logging mills sprouting up on the Island, it flourished in its own modest way. In 1920, Oak Harbor boasted 411 people, and Coupeville, 343 residents. A mosquito fleet of steamboats provided the Island’s lifeline to Seattle. A ferry also carried cars across Deception Pass, from Hoypus Point to Yokeko Point, starting in 1912. To summon the ferry, one had to bang a sawblade with a mallet, and then wait for it to cross the swirling waters. The idea of a bridge connecting Whidbey Island to Fidalgo Island, and hence to the mainland, was conceived as long ago as the 1880’s by Captain George Morse, a sea captain who had settled in Oak Harbor. “One day we will have a bridge across this pass”, he told his children as they sailed through it. The need for a bridge grew, but it was a long time coming. It took another fifty years, some very persistent Islanders and legislators, and a public works project named the Work Project Administration, that was initiated during the great depression, to bring the bridge to fruition. The Civilian Conservation Corps meanwhile built the road approaches to the bridge. In 1907, Morse, now the Oak Harbor representative to the state legislature, facilitated the passage of a bill to set aside $90,000 for the bridge. Years later, citing the bridge’s strategic military placement, the American Legion convinced legislators to pass the 1929 Bridge Bill, which was, however, vetoed by Governor Roland Hartley. Eventually though, bridge legislation passed in 1933, largely supported by the Deception pass Bridge Association—and this time it stuck. Constructed by The Puget Sound Company and Wallace Bridge and Structural Steel Company, both Seattle based, the bridge was a considerable feat of engineering in its day and still has an impressive and dramatic presence, being listed on the National register of Historic Places in 1982. Construction did not go without its challenging moments. When it was time to drop the center span into place, it was found to be 3 inches too long. The engineer, Paul Jarvis, displayed some good old American ingenuity by having the crew return the next morning before dawn, when it was 30 degrees colder and the bridge had contracted, and lowered the center span into place—it fit perfectly! The bridge is actually two separate bridges linked together in the middle on tiny, rocky, Pass Island. From Whidbey to Pass Island, the Deception Pass Bridge is a massive cantilevered truss of 975 feet, and from Pass Island to Fidalgo Island the steel arch Canoe Pass Bridge is another 511 feet long. Twenty-eight feet wide to accommodate two car lanes, and sidewalks on both sides, the Bridge cost $482,000 to build. For spectacular views of the Bridge and Pass, walk across the Bridge from end to end, and then stroll down the trails from the car park and admire it from underneath. Here you’ll get an appreciation of the massive size of the steel beams. And the views from the beach below and to the sides are equally splendid. It was a grand day for all when the Bridge finally opened on July 31, 1935, having taken exactly 11 months to construct. It must have been a spectacular sight as 5,000 people turned up at the opening ceremony, and seven hundred cars drove over the bridge, tooting their horns, with excited passengers leaning out for a view of the pass below. The Bridge’s legacy was to open up Whidbey Island for recreation, commerce, and settlement, and the Bridge, Pass and Island remain today some of the Pacific Northwest’s best tourist attractions.